IT’S now much easier and quicker to enter the Cuestars Fantasy Snooker League. Simply go to https://www.cuestars.co.uk/fantasy-snooker-league-info/, fill in your name and email address, and pick one professional from each of the six drop-down menus. There is no entry fee. The person whose players collect the most ranking points during the 2018/19 season will pocket £100 prize money and take on the guest professional in an exhibition frame at the under-21 finals day. You must have renewed your Cuestars membership for the new season or joined for the first time. Renew or join now at https://www.cuestars.co.uk/membership-form/. Closing date for entries is September 1. In the event of a tie, the prize will be shared. 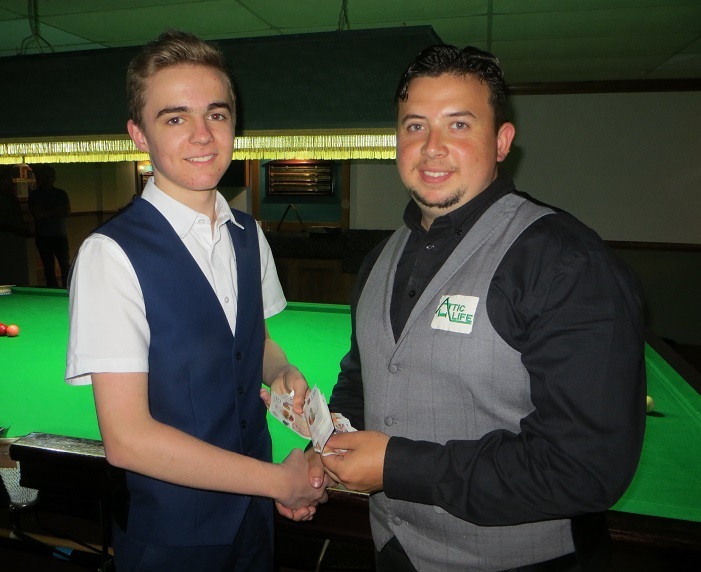 Steven Hughes topped the lot last season and picked up £100 from rookie professional Billy Castle in Swindon in May. The 16-year-old from Chandlers Ford was the only player to beat Castle. And, to add insult to injury, he revealed that Castle was not one of his players! Steven Hughes (left) collects his £100 from Billy Castle.